Teaching with GIS allows geoscience students to work directly with data in the field and classroom and to develop and refine their spatial reasoning skills. These skills are an integral part of a geoscientists' habits of mind, which are essential for moving from a novice to an expert geoscientist. Explore example learning goals for an intro-level GIS or Remote Sensing Course from your colleagues. Learn more about setting effective course goals from the Course Design Tutorial. Browse course descriptions and syllabi from your colleagues to gauge the range of GIS and remote sensing courses currently offered. Aligning your assessment strategies with the goals of your course is an essential part of the design process. You can learn more about assessment in the section about Assessing Student Learning in the Course Design Tutorial and through our module on Observing and Assessing Student Learning. The pedagogic techniques highlighted below can provide inspiration as you consider various approaches that will help you achieve your course goals. The resource collections are organized to provide a rich set of materials to draw from in constructing the specific set of learning experiences you want for your students. Finally, explore the more in-depth information and ideas available in special topics. Course descriptions and syllabi including course learning goals and supporting information. See the variety of approaches that faculty use to teach GIS at the college/university level. Also, view example learning goals for an intro-level GIS or Remote Sensing Course. 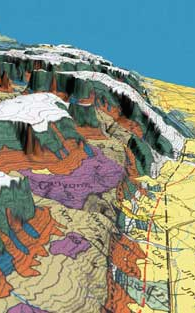 GIS for Geoscientists is a one-semester introductory level GIS course taught by Barbara Tewksbury at Hamilton College. The online resources include a syllabus with goals, all homework and lab assignments, a semester portfolio assignment, and a final project. Introduction to Remote Sensing is a one-semester introductory level remote sensing course taught by Mohamed Abdelsalam at Missouri University of Science and Technology. The online resources include all of the course PowerPoint presentations plus all lab assignments. You can download a zipped folder of course materials (Zip Archive 249.6MB Aug25 10) that contains all PowerPoint slides from Mohamed's course plus all lab activities (note: this is a large file and may take time to download). Teaching activities that range from teaching GIS or remote sensing concepts to using GIS or remote sensing to teach geoscience. Data sources for GIS/RS analyses: Online data sources for georeferenced data have become a critical component of spatial analysis. Our listings contain links to the thematic, topographic, and remote sensing data sources widely used by geoscientists, including a list of links to data sources for individual states in the US. The workshop was attended by 70 college and university faculty who teach GIS and/or remote sensing. The workshop web site contains the workshop program with links to all of the presentations given by participants and invited speakers at the workshop, a list of participants and their contributions to the online resource collections, and information about the workshop itself. Contribute Materials: Do you have teaching materials, references or web sites you use and recommend for teaching GIS? We encourage you to share your favorite teaching materials and help us expand the resource collections. Join the Discussion: Share insight, ask questions or network with other faculty by joining the Teaching GIS email list. This link will also provide access to the email list archives or allow you to unsubscribe.